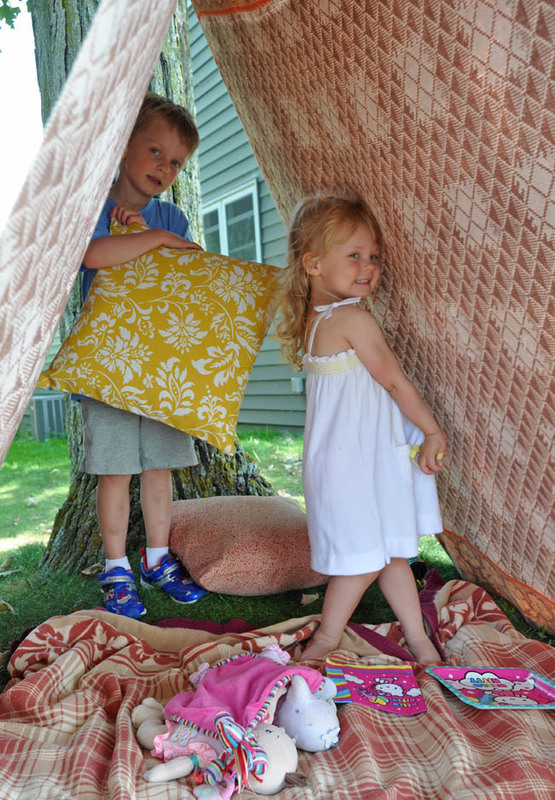 I’ve seen a number of super cute outdoor tents/forts this year in magazines, on Pinterest, etc. 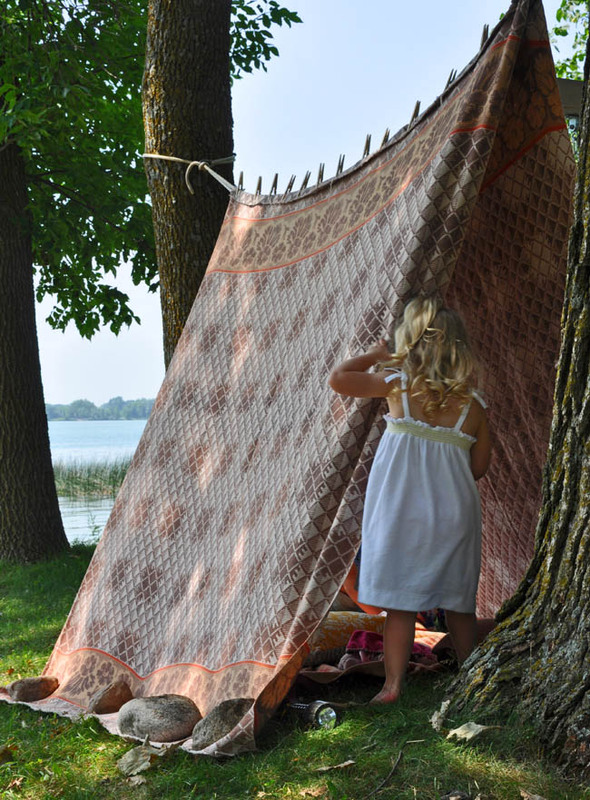 (for example, here) and have been reminded of how we used to make that happen at the cabin as kids. Rather, how my mom made it happen. 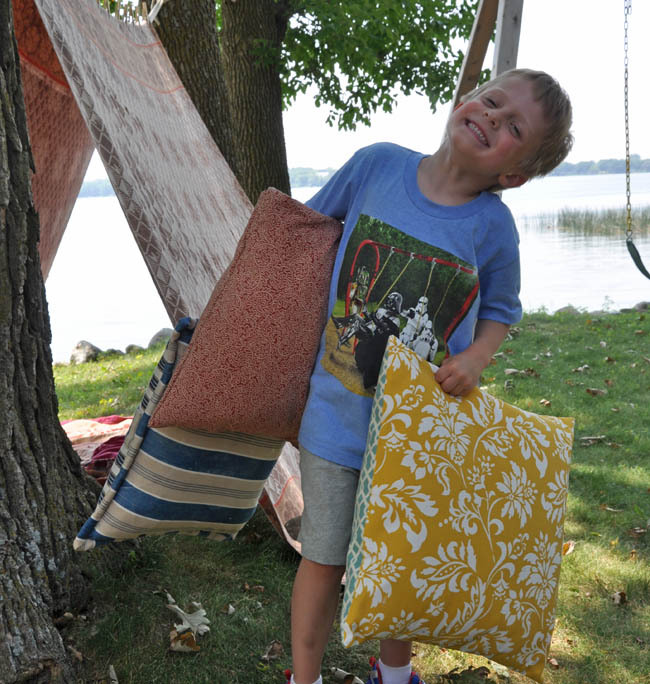 I gathered the same materials my mom used when I was a child (truly – we’ve had these Beacon camp blankets for as long as I can remember) and Trevor “built” one for the kiddos. Note that our version is quite a bit easier than the showy ones you see online, but this is right up our alley from a building perspective as it takes little time and zero tools. Just a rope, a couple of blankets, clothespins, and some hefty rocks and you’re good to go! We’ll try it again when the weather cools and hunkering down under blankets seems even more inviting. Tie the rope between two trees and secure one blanket on the line with the clothes pins. Add the second blanket to the other side and fold over at the top, securing again with the clothespins. Put the blankets at an angle and anchor the edges with the rocks. Part of the fun is for the kids to head into the cabin to find things they want to bring into the fort. 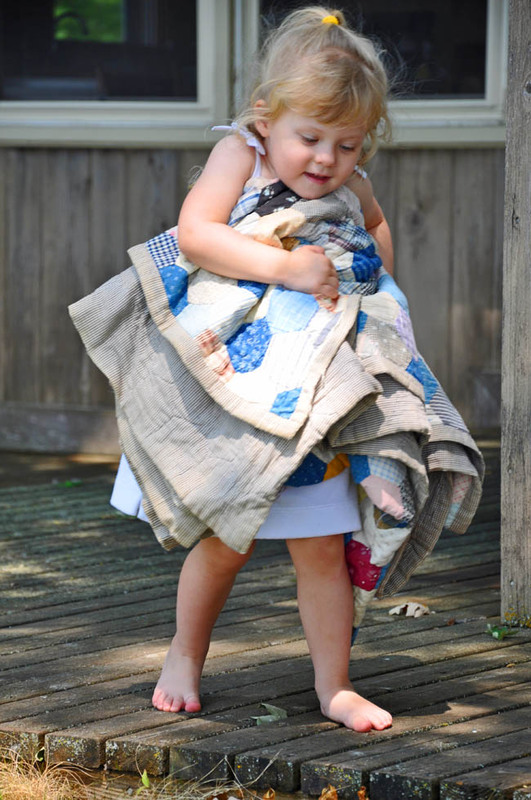 Ella nabbed this comfy quilt right away, which I remember being my favorite as a little girl. Taylor had the great idea of grabbing the pillows off the porch. Of course – what’s a fort without pillows? 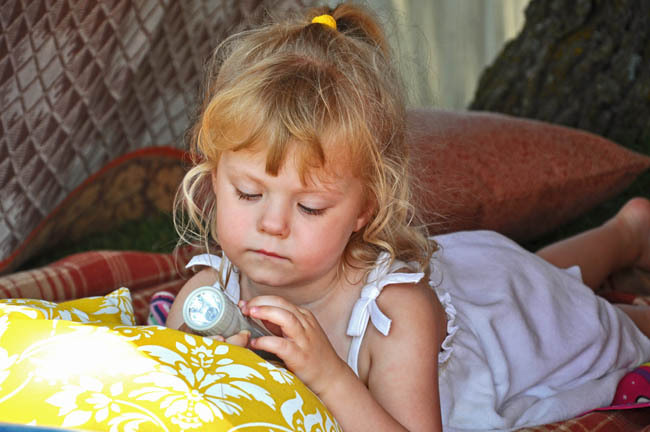 Ella played with this flashlight forever. Well, forever in toddler time, which is the equivalent of ten minutes or so. Reality Check. The weekend that these pictures were taken, the fort was about the greatest thing in the world. We assembled the hideaway again this past weekend and it seemed as though the blankets were made of invisible cotton. Neither T or E glanced at it. I’m not sure if it’s all kids, or just mine, but what holds their attention from one week to the next varies, without much rhyme or reason. My goal, therefore, is to create fun activities but have the required parent prep be quick, easy and inexpensive. Don’t believe me? The other day I convinced the kids to play with sticks in the yard (still figuring out how to work that into a post).